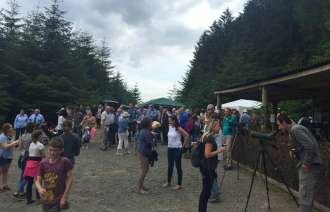 Last Saturday, we were celebrating the official opening of the South West Mull & Iona Development Trust Community Forest at Tiroran. Mull Eagle Watch were delighted to be a part of this wonderful day and visitors were amazed to see a display from Iona, the female, having a grapple with the local buzzard who had flown a bit too close to the nest. As well as enjoying the sunshine and the delights of the forest, visitors enjoyed views of the 2 chicks on the nest and at the end of the proceedings, as if on cue, Iona did a fabulous fly over as if to wish everyone good luck in the new community forest. This week has been very busy with the ringing team on the Island. As the Tiroran nest is one of the last to hatch, they were left until last to have their leg rings put on to ensure the chicks were big enough. So Friday morning dawned and our visitors on the morning trip had great views of Iona, as she sat in a nearby tree as the ringers climbed the tree to the nest. It really is a strange sight seeing a grown man appear on a white tailed eagle nest. After they had put on the rings, weighed and measured, Dave Sexton and the ringers, Justin, Jo, Marc and Andrew came up to report on their findings. When I saw Dave's face I knew something was wrong and in that instant I knew what he was going to say. "the little one didn't make it". There was a sizeable difference between the 2 chicks and I knew it would be tough but I had everything crossed for the 'little one'. My heart sank - and managed to put on a brave face - I was gutted. Its funny how we always want the underdog to pull through. 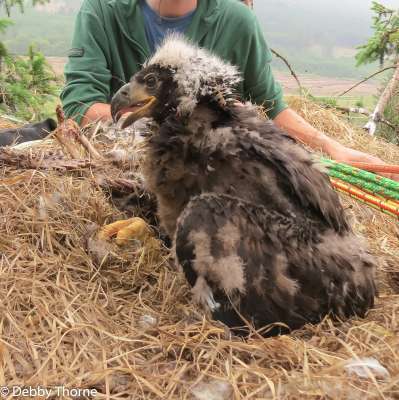 It will be sent away for research to see if there are any clues as to why it didn't survive - there was certainly plenty of food on the nest - we have experienced some real extreme weather on Mull from snow just before hatching to very hot and humid. At the moment, we just don't know why but will let you know if we are able to find out anything more. The first chick is doing great and we await to see whether its male or female. Here is the first photo of the chick - you can see it still has some of the fluffy down on top its head and on the wings - this will disappear as more of the dark brown feathers come through. It has 2 leg rings - one is a BTO (British Trust for Ornithology) and the other is a coloured leg ring with the chick's unique numbers. As you can see, a very healthy looking chick, now 6 weeks old. Iona and Fingal will now concentrate on bringing in food for their youngster - who is now starting to feed itself, tearing bits off and rummaging around the nest. In due course, our local primary children will name the chick so will keep you posted. Mother Nature can be cruel at times but sometimes its her way of saying something just isnt right. However, Fingal and Iona still have a very healthy chick and we are getting some great views of it moving around the nest as well as great flying displays from Fingal and Iona. Come and see us at Mull Eagle Watch Booking is essential - call our friends at VisitScotland Craignure on 01680 812556.